Background The kidney proximal convoluted tubule (PCT) reabsorbs filtered macromolecules via receptor-mediated endocytosis (RME) or nonspecific fluid phase endocytosis (FPE); endocytosis is also an entry route for disease-causing toxins. PCT cells express the protein ligand receptor megalin and have a highly developed endolysosomal system (ELS). Two PCT segments (S1 and S2) display subtle differences in cellular ultrastructure; whether these translate into differences in endocytotic function has been unknown. Methods To investigate potential differences in endocytic function in S1 and S2, we quantified ELS protein expression in mouse kidney PCTs using real-time quantitative polymerase chain reaction and immunostaining. We also used multiphoton microscopy to visualize uptake of fluorescently labeled ligands in both living animals and tissue cleared using a modified CLARITY approach. Results Uptake of proteins by RME occurs almost exclusively in S1. In contrast, dextran uptake by FPE takes place in both S1 and S2, suggesting that RME and FPE are discrete processes. Expression of key ELS proteins, but not megalin, showed a bimodal distribution; levels were far higher in S1, where intracellular distribution was also more polarized. Tissue clearing permitted imaging of ligand uptake at single-organelle resolution in large sections of kidney cortex. Analysis of segmented tubules confirmed that, compared with protein uptake, dextran uptake occurred over a much greater length of the PCT, although individual PCTs show marked heterogeneity in solute uptake length and three-dimensional morphology. Conclusions Striking axial differences in ligand uptake and ELS function exist along the PCT, independent of megalin expression. 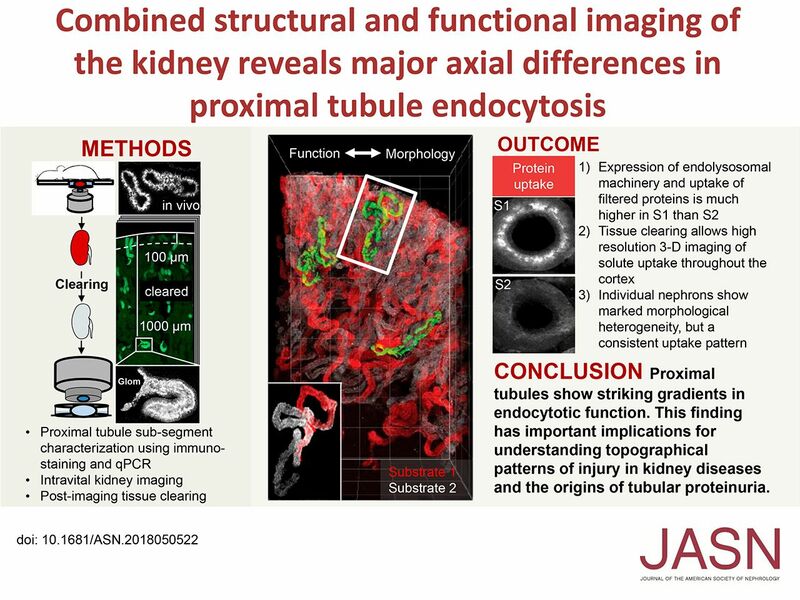 These differences have important implications for understanding topographic patterns of kidney diseases and the origins of proteinuria.